First of all, let’s make sure Cortana is set up correctly: you should find it on the Start menu. Select Cortana, click the settings icon (third from the top) then select Settings from the menu: make sure Cortana and the “hey Cortana” audio shortcut are both switched on. You can then call out “hey Cortana” followed by your command. Use “turn off Bluetooth” or “turn off wifi” to disable these features (or replace “off” with “on” to do the opposite). You get a confirmation message that the switch has been made. Try “open Photoshop” or “open iTunes” or anything else that’s currently installed on your local computer. If Cortana doesn’t understand (or there’s a choice), it asks for further clarification. You can get to various areas in Windows 10 too: tell Cortana to “open Control Panel” or “open Settings” to do just that. You can get to the new-look Action Center in the same way. You can ask Cortana to do tasks like “change wallpaper” and you get a link straight to the relevant part of the system. But the app can’t actually change the wallpaper using voice commands just yet. Tell Cortana to “play music” and the Groove Music app starts and begins to shuffle through the tunes you’ve got stored there. You can specify individual artists too. Really need to remember something but don’t have a pen to hand? Tell Cortana to remind you to do something or “set an alarm for...” and the app takes care of the rest. Use “search” followed by what you’re looking for: try “files” or “photos” or “spreadsheets” for a broad search, for example, or add a specific filename keyword on the end. You can use natural search terms to restrict the query by date too, though this can be a bit hit and miss depending on what you’re looking for. It’s not very precise, but it’s quick. If you’ve configured the integrated Mail app for Windows 10 then “send email” lets you compose a message through Cortana—you’ll be prompted to speak out all the key info. You can of course run web queries through Cortana (“what’s the weather like?”) but here we’ve focused on commands that actually let you do stuff inside Windows 10. A growing number of third-party apps for Windows 10 now support Cortana commands as well, including Netflix. 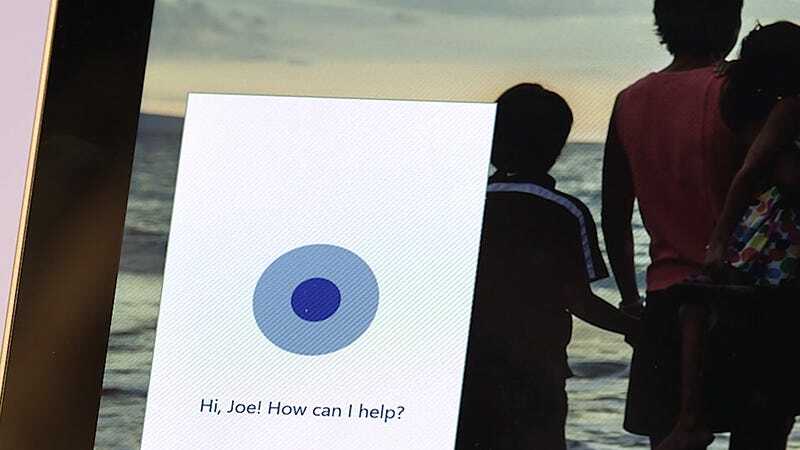 For a full list of supported commands, ask Cortana for help. Our friends at Lifehacker have previously posted a comprehensive rundown of Cortana commands, and we’ve covered some others before, including translation options.